dedicated to the industries that keep our world in motion. Serving Technology, Driving the Future. For over 30 years Ensil has been dedicated to excellence in PCB Repair, Electronics Rework, Electronics Design and Manufacturing in the field of Industrial, Aerospace, Defence, Robotics and Medical Industries. Ensil fulfills offset and IRB commitments for contracts with the Government of Canada on behalf of USA and European Defence OEMs. Expressions of interest in offset fulfillment are welcomed. Ensil operates under CAGE code L1679. Members of our engineering team are looking forward to support your engineering projects and requirements for expert circuit board repair, reverse engineering, engineering design and custom prototyping services. Our services fit your Electronics. Ensil’s electronics manufacturing, design and reverse engineering capabilities are ready for your next project. 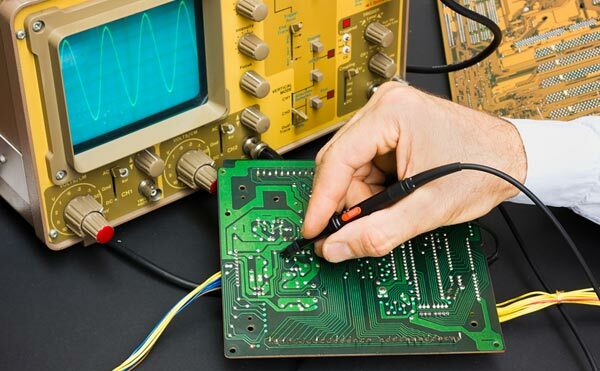 Whether you need custom prototyping, technical consulting, compliance registration services of electronic printed circuit boards Ensil can be your partner from concept to finish products. Supporting technologies that assist our soldiers is at the core of our business. We are proud to repair and maintain electronic components in the land, sea, and air divisions of the Canadian military and government agencies that keep Canada strong and free. Extend your investment in your machines and robots with Ensil’s industrial repair services. When performance falls short of expectation or a component fails, our repair and remanufacturing technicians will get your production back on schedule.